My closet dream has become a reality! NOT a pretty site. It was dark and cluttered, items all over the floor, mismatched hangers and over stuffed top shelving. It was at this point that I decided to take a closet organizing class offered by Aby Garvey over at www.Simplify101.com. It has made so much difference in the way my closet looks and feels. 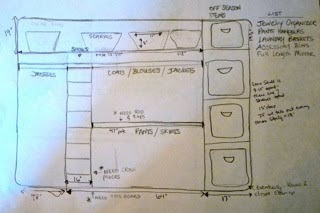 First, I sat down one afternoon and started mapping out what I DID want in a closet, took some measurements, surfed the internet for ideas and I was on my way! The results?? Here is the finished, empty closet. We built in shelving which I had planned to use for shoes, but since I don't WEAR a lot of shoes, I'm using to hold off season sweaters, rain gear and other items. Before, our lighting consisted of two small watt bulbs in round globes. Now the lighting has almost doubled by switching to florescent bulbs and longer light fixtures. I LOVE the new rods dividing blouses and pants. We looked at some rods that were painted white and I don't know about you but, they get the paint all scratched off over time so we opted to just keep them natural. There is plenty of room to put up all my jeans I was currently keeping in a drawer. It's a MUCH better use of space! Then Mike re-did the upper shelves so they could accomodate some bins I already had. Come to find out, my old shelves weren't really up to code and not being supported the way the ought to be so this was a great time to make the swap. And when my closet was totally empty, I went in and painted everything with new white paint. It looks so much better now and I love going in there and just looking around! LOL! There is still some tweaking to do. I want to label the bins above and tweak the items I have hanging just a bit. And.... confession.... I DO still have some items without a home I will have to find a NEW place for. But I'm motivated and want to finish out my "re-create" year by getting it done! Thanks for following along as I made my progress and I hope all of you will get some inspiration and find that area in your house you've been procrastinating fixing up and tackle it. It makes you feel so GOOD inside!